What do you mean, "Ech"? 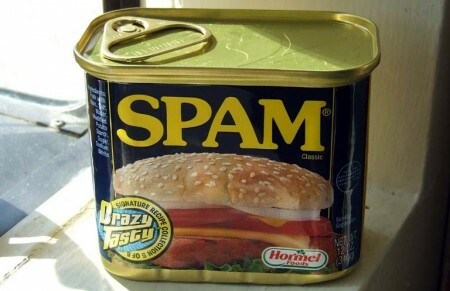 I'm not sure where Spam gets its bad reputation; perhaps it's because it comes in a can. Food snobs turn their nose up at it, likening it to the meat version of Cheez Whiz. Even the great food explorer Andrew Zimmern expresses his disdain for it. You know a food is feared when people prefer blowfish to it, but Spam also generates somewhat of a cult following. We'll talk about where Spam gets elevated to cause célèbre status, but first let's discuss its humble origin. Spam was originally made by Hormel Foods of Austin, Minnesota way back in 1937. Although alternating versions of the name attribute it to an alliteration of "Shoulder of Pork and hAM" or the simpler "SPiced HAM", Hormel maintains that the name is an adjective, and insists that it is spelled with all upper-case letters. One of my personal favorite plays on the acronym is "Something Posing As Meat." The ingredients state it is chopped pork shoulder with added ham meat. 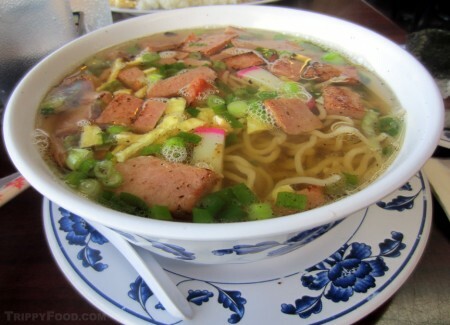 It gained a surge in popularity during World War II, especially in Hawaii where fresh meat was difficult to come by. American soldiers ate it with most of their meals, and it continues to be eaten by more Hawaiians that anywhere else on earth per capita. As I discovered on a trip to Austin, Minnesota (for non-Spam purposes), you can smell it throughout the town (those of you living near Heinz in Pittsburgh or General Foods in Woburn, Massachusetts know what I'm talking about). Blogging about a canned food item found in grocery stores worldwide doesn't seem particularly trippy, but here my friends is where we talk about Spam being the cause of celebration and the creative ways it is used. Let's start with the yearly celebration that has taken place in Austin, Minnesota's namesake city of Austin, Texas annually since 1976. Spamarama has been a no-holds barred festival of potted pork, incorporating games into the festivities. Regular events include a Spam tug-of-war (across a pit of Spam gelatin), a Spam-eating contest (not for the faint of heart), and my personal favorite, the Spam Toss. Picture the old fair staple of the egg toss; now substitute the egg with a can of Spam, freshly opened and still glistening with gelatin. One winner grabbed the pork projectile and clasped it safely against his chest like a football, essentially ruining his T-shirt. The Spam cook-off has produced items such as Spam brownies (I am not joking) and Spam ice cream; judges are required to sample all the items in the competition. 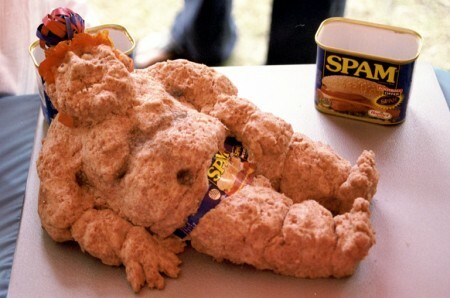 In a nearby tent, the Spam sculpture contest is held with most looking like a bizarre autopsy. Sadly the economy has taken its toll on the festival - it was not held at all in 2008 and it looks like since corporate sponsorship from Hormel has been greatly reduced that 2009 saw no Spamarama either leaving its future in doubt. Fret not if you are looking for the ultimate Spam party; you can still find it in the capital of Spam consumption - Honolulu, Hawaii. Since 2003, the free Spam Jam has been held on a closed-off section of Kalakaua Avenue just off Waikiki Beach. As opposed to Spamarama, Spam Jam is generally held at night with booths selling Spam merchandise and local restaurants who try their hand at creating interesting takes on the canned meat. Spamghetti and meatballs, Spam pizza, you name it, they've tried it. Rather than compete the foods in a contest, the concoctions are sold to the festival attendees. Several stages feature live music, while the center stage crowns a king and queen of the festival. One of the treats being sold is a Hawaiian favorite - Spam musubi. Think Spam on sushi rice with the obligatory seaweed wrap and topped with a teriyaki-like brown sauce. Odd as it sounds, it's quite delicious. The Spam is cooked (sorry to disappoint the sashimi lovers) and the meat provides the flavor to the rice with just a little kick from the sauce. It's larger than your typical sushi, so eating it can get messy, but it's worth it. 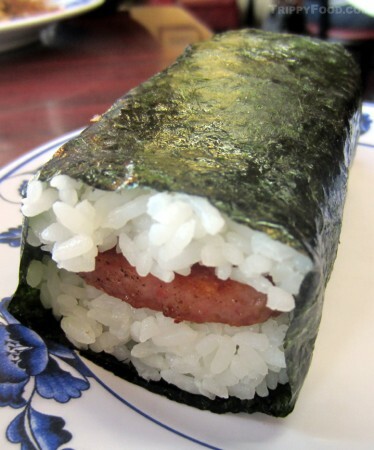 Stateside, you can find Spam musubi as a staple in most Hawaiian BBQ joints (such as L&L Hawaiian Barbecue, Ono Hawaiian BBQand even the Waikikie Hawaiian BBQin Atlanta), although there are few east of the Mississippi. This entry was posted in Trippy Food (Tasty flora and fauna), Trippy Happenings (Events), USA and tagged Austin, canned, Hawaii, Minnesota, pork, SPAM, Spam Jam, Spamarama, Texas. Bookmark the permalink. 10 Responses to Spam, Wonderful Spam! Sadly, Larry, most of the restaurants with the word “Hawaii” in their name in the Boston area are Polynesian/Chinese. I was unable to find anything – the closest I could find is probably L&L Hawaiian BBQ in New York City. Spam musubi is pretty simple, so you may be able to make it at home with very little trouble – there’s a recipe at http://allrecipes.com/recipe/spam-musubi/detail.aspx. How many drinks did you have in that last pic of you vs. the musubi? Never had Spam before. Love the post, but I think I will continue my tradition. TV – I’ve seen some of what you’ve whipped up (lamb sliders and chicken meatballs, for instance), and quite frankly, SPAM isn’t that drastic. Just don’t eat it right out of the can. You can always fall back on the old American standby of fried SPAM with eggs for breakfast, but I’ll bet you can come up with something cool on the grill. Give it a try – if you don’t like it, at least you tried. I’m imagining ripping the singing and dancing can open to have some SPAM… funny commercial, thanks! Delicious.. I love spam musubi! it makes surprisingly few appearances in restaurants (with the exception of Hawaiian BBQs) – all it would take would be a few good chefs to turn SPAM’s reputation around. Where is your favorite place for musubi, Garick?